We inform you about the evolution of your products’ prices on the websites of your distributors and competitors. 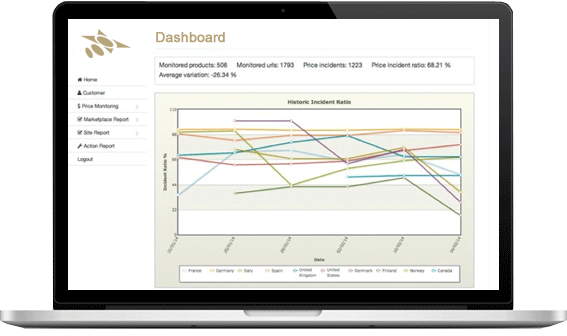 Detect what distributors meet your pricing policies and help you maintain the value of your brand. Stay up-to-date of changes in market prices and competition. Monitor the degree of compliance with your policies branded by your distributors. Award distributors who care the most for your products. Promote policies among distributors to improve the image of your products. Detect and categorize websites that market yourproducts. Find out which websites sell or speak about your products. Get alerts about fraud and forgery. 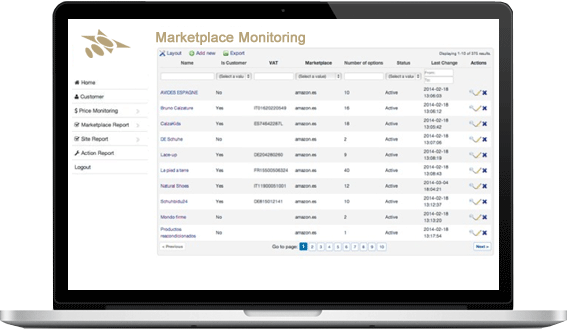 We monitor and categorize the presence of your products in marketplaces (Amazon, eBay, etc.). Find out if your customers sell through marketplaces. Uncover forgery or fraudulent offers.